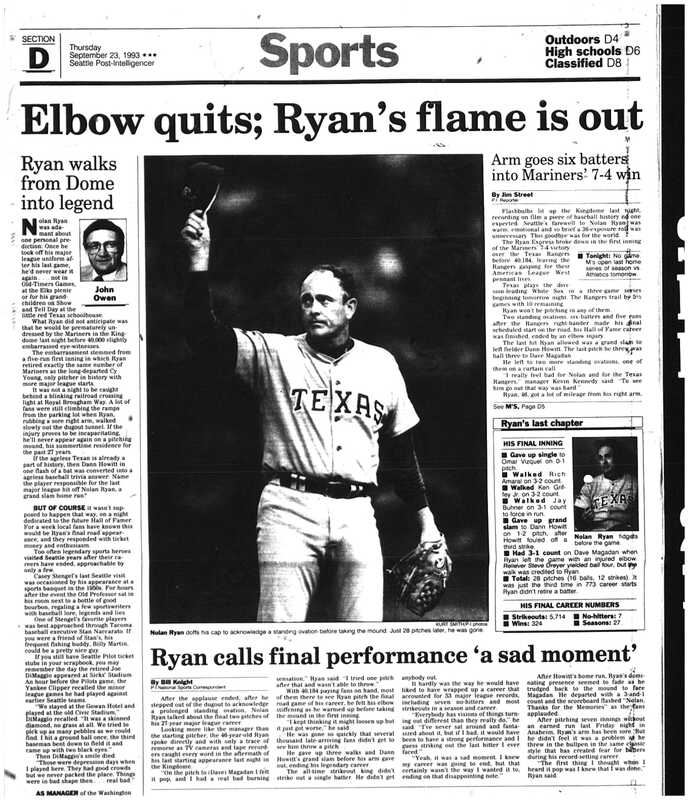 Nolan Ryan’s career ended in the Kingdome on September 22, 1993. Bob Sherwin of the Seattle Times reported that in the first inning of a game vs. the Seattle Mariners “a right-elbow ligament, 46 years, seven months and 24 days old, punished by more than 80,000 big-league pitches, had enough. “Ryan, who was just 11 days short of finishing his record 27th and final big-league season, had his playing days ended abruptly in the first inning at the Kingdome. “He suffered a torn ulnar lateral ligament while pitching to the Seattle Mariners’ Dave Magadan. Age caught up to Ryan before most big-league hitters had caught up to his fastball. “The elbow was tight when he warmed up before the game and ached in the first, Ryan said. Ryan left the game holding 53 major-league records, but also having given up a grand slam to Dann Howitt, the last batter Ryan faced, sort of: Ryan then went to a 3-1 count on Dave Magadan before leaving the mound. Magadan’s walk was charged to Ryan. Sherwin added: “The night had a special atmosphere as most of the 40,184 fans anticipated Ryan’s final road start. He was given a standing ovation as he walked to the dugout before the game. “Ryan was the last player out of the Ranger dugout in the bottom of the first, jogging to his position as the fans again stood and applauded during his warmup pitches. “It was a late-arriving crowd. Ticket windows were reporting lines still five or six deep even when Ryan already was on the trainer’s table. The late-comers found Ranger reliever Steve Dreyer pitching. “Flashbulbs popped with each Ryan pitch, especially when he faced Ken Griffey Jr. 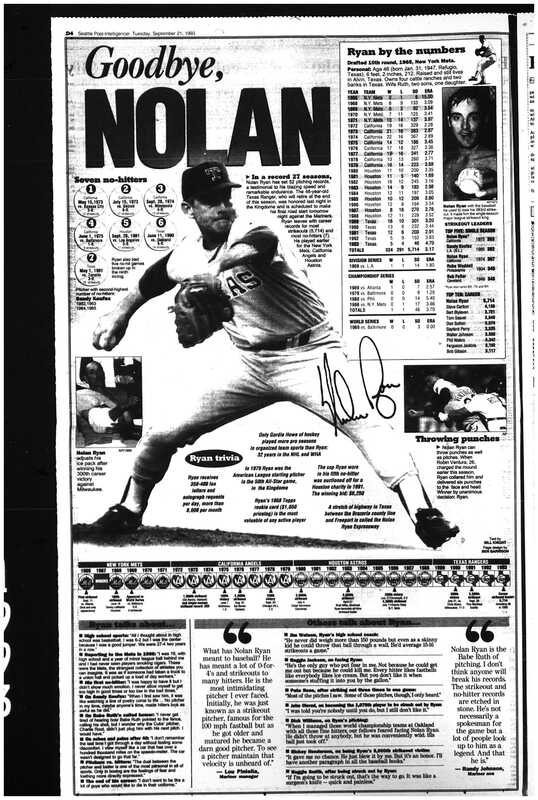 But it was clear this was not no-no-Nolan. His pitches were all around the plate, rarely over it. He threw 28 pitches, only 12 strikes. “I was just trying to squeeze a few more innings out. It is sad from the standpoint I knew my career would end this year and . . I did not want to end it this way. Dann Howitt said of hitting his grand slam: “It has to be a thrill, but the way I’ve been struggling it would have been a thrill to get a homer off a rookie. You face him and you’re honored to strike out as much as get a hit. I may have had a couple of hits off him but from stories I’ve heard of Ryan’s aggressiveness, I’m glad they came when he was 46, not 26. When Randy Johnson takes the mound Sunday against Oakland in the 1993 Kingdome finale, he might be a changed man. The Seattle Mariner ace may ask the club for permission to wear No. 34 for one game, in honor of his friend and pitching mentor Nolan Ryan. Needing two wins for a team-record 20, and 14 strikeouts to become the eighth American League pitcher to reach 300, Johnson hopes for a different outcome than the last time he switched numbers. In an effort to reverse his luck last July, the 6-foot-10 left-hander wore 15 instead of his usual 51 and lost 7-6 at Yankee Stadium after a flock of unearned runs. Ryan’s seven no-hitters were joined by 12 one-hitters, and his 773 starts were, and are, the second most in MLB history, behind only Cy Young. You can look here for some coverage of the most famous moment in his last season: getting in a fight of sorts with Robin Ventura about six weeks before his final start. And here for him and Rickey Henderson talking about Ryan’s 5000th strikeout. By the way, Ryan was 46 years, seven months and 24 days old for his last game, and Randy Johnson was 46 years and 24 days old, I believe, for his last game. If you’re interested, you can read my impressions of Randy’s last game in Seattle.